After this, Paul then proceeds with the practical, having completed in full his dissertations on the doctrinal aspects of this epistle, and here in chapter 15, he completes this aspect before he begins to address administrative concerns in the next chapter. In the beginning of the chapter we are dealing with now, he writes some last minute thoughts regarding those who are “strong” in the faith that are to help those who are “weak”. Once again we are reminded that we are to follow our LORD Jesus’ example as humble servants of the LORD God, not self-seeking, but desirous of being used as vessels of God’s grace to bless others, and in this case, those members of the body of Christ who are weak and needy; the word for “infirmities” in the Greek means “feebleness, malady, frailty, lacking strength”. In a spiritual sense, we may incur such weaknesses from a poor ‘spiritual diet’ of (a lack of) the Word, or negligence in prayer, or sin’s evil work in causing damage to one’s ability to express faith in God, or any of these things and more. Thus we are to “bear the infirmities of the weak” by nursing such saints in the Word, prayer and godly fellowship. The ultimate example of course of servant-hood is the Supreme Sacrifice made by our LORD Who Himself bore our sins and the reproaches that were our own (GAL 1:4; HEB 1:3; 7:27). If any are strong, its only by the grace of God and without any credit due to ourselves, thus there is no room for boasting or feelings of superiority; there are none ‘higher’ or ‘lower’ than any others in the kingdom of God, for we have one Lord and Master Who is above all of us, and we His saints are all equals (MATT 23:8-9; “brethren”). There are many saints who prefer the New Testament Scriptures over the Old, and certainly we are in the new dispensation of the ‘church age’ and no longer “under the law” because of the new testament in the LORD’s covenant by blood (MATT 26:28; HEB 9:15-16;12:24;13:20-21). However, the Old Testament Scriptures are still and always shall be valid for the spiritual truth they provide and this is a proof text for us, because “aforetime” included none or at most, only a very few New Testament Scriptures; the vast majority of the Scriptures at hand were Old Testament (or “Tanahk”). The church can learn about God through His dealings with the nation of Israel; how though they may have been unfaithful throughout their history, God nonetheless kept (and will keep) His promises to His people, because His dealings with them (as well as us) is solely by grace (unmerited favor). This has been discussed on TTUF previously and you may access the two part article here: ISRAEL MATTERS. You can also watch this sermon (given by yours truly) by the same title. The Scriptures, Old Testament or New will always yield the blessed fruit of hope and faith for the believer, for as the Word declares, “Faith comes by hearing and hearing by the Word of God.” (ROM 10:17). Patience, comfort, as well as joy, peace, goodness and knowledge and of course, hope (see vs. 13-14) is all as a result of partaking of the Word of God. And is further expressed as those who are in the “unity of the faith” (EPH 4:13) and “in the Spirit” (EPH 4:3). Since we are in fact all believers, all saints, all brethren with no one being superior or greater in spiritual quality in the Eternal eyes of God Who sees us complete in Christ, we should have no issues with receiving one another, even those who for reasons (of carnal thinking) would seem despised by others – because we are all received by the Holy and glorious Christ of God. Basically, if we are all good enough for Jesus to receive BY GRACE, then by grace we should receive one another! Here the apostle addresses the truth regarding God’s destiny for both the nation of Israel as well as that other “holy nation” that comprises the church (1 PET 2:9). Seeing that Jesus Christ was a “minister of the circumcision” His conduct as the Messiah of Israel is then manifested; as we know He was first proclaimed to Israel and preached what the Scriptures declare as “the gospel of the kingdom” (MATT 4:23; 9:35; 24:14; MARK 1:14). This was a very significant term to the Jew, for they understood that this was (and is) in reference to the kingdom of David, whose holy authority and rule would one day belong to the Son of David – the Messiah of Israel, Y’shua ha Meschiach (see 2 SAM 7, particularly vss. 8–13 and also PSALM 89:1–4; 28–37). Indeed, the “promises made unto the fathers” are all complete in the Person of Jesus Christ, not just in what He has already accomplished, but in what He will yet do for His people Israel in the not too distant future ahead! Thank You LORD!! However, His magnificent grace is not only bestowed upon Israel, but also the Gentile nations as well – something that many in Israel had forgotten during the times prior to and during the days when Christ walked the Earth. 49 Therefore will I give thanks unto thee, O LORD, among the heathen, and sing praises unto thy name (quoted in ROM 15:9). 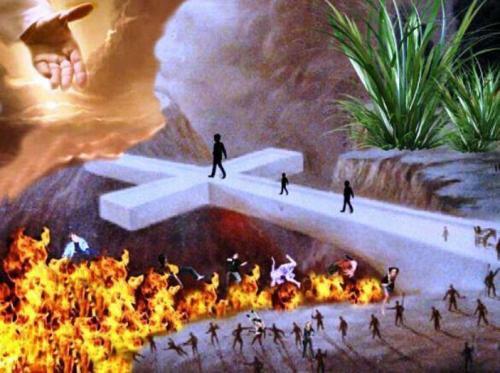 43 Rejoice, O ye nations, with his people: for he will avenge the blood of his servants, and will render vengeance to his adversaries, and will be merciful unto his land, and to his people (ROM 15:10). Therefore I will give thanks unto thee, O LORD, among the heathen, and I will sing praises unto thy name (ROM 15:11). 10 And in that day there shall be a root of Jesse, which shall stand for an ensign of the people; to it shall the Gentiles seek: and his rest shall be glorious (ROM 15:12). Thus it is amply demonstrated that not only Israel shall be blessed (though she shall most certainly, for Abraham’s sake, be afforded a special place of honor by the grace of God) but also the Gentile nations that expressed “like faith”, and therefore, grafted in to the olive tree that is spiritual (or believing) Israel. This was likewise addressed in ACTS 15:13-18. 8 (For he that wrought effectually in Peter to the apostleship of the circumcision, the same was mighty in me toward the Gentiles:). What must be absolutely clear however is that there is only one Gospel Truth established by God’s grace, but simply delegated to the Jew and Gentiles differently. To the Jew, this Gospel brings the promise of the reign of Messiah over the (born again) nation Israel (See EZEK 36:26-27); to the Gentile, this same Gospel brings promise of no certain dwelling place on this Earth, without a land and a city to call their own, but rather an eternal kingdom and a heavenly city (which the Jews shall also be blessed with, once the old heavens and old earth are destroyed by God and replaced with new; see among other references: REV 20:11; 21:1-2; 2 PET 3:10-13). Again, this “hope” that is spoken of here is not a wistful, wished for, uncertain kind of hope but the sort that is closely related to what the Bible speaks of as faith. It is a sure hope predicated upon the Holy God Who alone keeps all of His promises. 10 For God is not unrighteous to forget your work and labour of love, which ye have shewed toward his name, in that ye have ministered to the saints, and do minister.11 And we desire that every one of you do shew the same diligence to the full assurance of hope unto the end: 12 That ye be not slothful, but followers of them who through faith and patience inherit the promises. 13 For when God made promise to Abraham, because he could swear by no greater, he sware by himself, 14 Saying, Surely blessing I will bless thee, and multiplying I will multiply thee. 15 And so, after he had patiently endured, he obtained the promise. 16 For men verily swear by the greater: and an oath for confirmation is to them an end of all strife. 17 Wherein God, willing more abundantly to shew unto the heirs of promise the immutability of his counsel, confirmed it by an oath: 18 That by two immutable things [God's promise and His oath], in which it was impossible for God to lie, we might have a strong consolation, who have fled for refuge to lay hold upon the hope set before us: 19 Which hope we have as an anchor of the soul, both sure and stedfast, and which entereth into that within the veil; 20 Whither the forerunner is for us entered, even Jesus, made an high priest for ever after the order of Melchisedec. God declared His promise to Abraham, and if that wasn’t enough He swore by an oath for good measure, though there was no one to swear an oath to (that was greater than the one making the oath, that is, God), so He swore to Himself. This is what Paul stated as “immutable” or unchangeable. God’s promises to Israel, to the church, to any individual saint that He addresses are no more changeable than God Himself: He is absolutely ‘as good as His Word’! We speak of God as One that is Almighty, One for Whom nothing is impossible, and the Scriptures declare this plainly (JER 32:27); and yet it is impossible for God to lie, because He is Himself the Truth. God cannot learn, because He knows everything. He cannot travel because He exists in all places and in all times all at once; He cannot do evil or tolerate it from others because He is holy. There are some things the LORD God cannot do because to do so would violate His immutable nature of holiness and love (to expound on this, please feel free to read an article FROM the MIND of FIRE: GOD in a BOX. Yet this immutability is of profound benefit for the saint; because God is unchanging (He doesn’t suffer bad moods and unpredictability) we can rest assured in all of what He has promised in His Word; this “hope” is a ROCK in any unstable situation, an ANCHOR in any tumultuous storm, a powerful BEACON in any dreary fog of doubt – “sure and steadfast”! That veil is in reference to that which separated the Holy of Holies from the rest of the Temple/Tabernacle – and within the veil the very Presence of God with Whom we have to do, and can approach with confidence as His child (HEB 4:16). Such “abound[ing]” hope in God, such access to His throne, such assurance in His promises can AND WILL bring about what Paul stated in Romans – “joy and peace in believing . . . through the power of the Holy [Spirit]” – as well as goodness and knowledge to the full, so that we are able to minister and admonish others in the faith. Note here that Paul speaks not of the “Gospel of the Kingdom” but the “Gospel of God” and “of Christ” which are not two different Gospels; both are the Gospels of Jesus Christ. For the Jew He is the Messiah-King Who has come to “save His people from their sins” (ISAIAH 53:4-5; MATT 1:21) and will one day return when Israel (believing Israel) repents and seeks His face (HOSEA 5:14-15); for the Gentile (and any Jew during the church dispensation), He is the Head of the Church and Lord of Glory (EPH 5:23; COL 1:18; 2 THESS 2:14; JAMES 2:1). Just as Israel was to be set apart and remain distinct from all other (Gentile) nations and remain a peculiar people, so too the Gentiles that comprise the church to be set apart, that is sanctified from other Gentiles “that know not God”. Again, going back to verse 4, where we may learn from “whatsoever things were written aforetime” we see in the Old Testament that the people of Israel left Egypt in the Exodus and entered into Canaan land; this is representative of being delivered from this world of sin, and crossing Jordan into the ‘Promised Land’ signifies salvation for the Christian. GOT QUESTIONS has an excellent article about what this 'Promised Land' and "entering into God's rest" means for the Christian. Yet there were enemies, even giants to defeat at the commandment of the LORD and this relates to the Christian as well in the area of sanctification – just as Israel slowly and gradually defeated the enemies in Canaan, the Christian slowly defeats the enemy that is his flesh and all of its sinful tendencies (To read more about sanctification, check out this TTUF article). We as the church are children of light and love, children of God and are not to have fellowship (communing, companionship, sharing in heart and mind, meaningful interaction) with the children of darkness outside of our declaration of the Gospel and being a faithful witness and minister for Christ: (see 1 COR 6:9-11; 2 COR 6:14-15; EPH 5:1-17). Never more than today does the church need to be taught and encouraged to (even rebuked for a lack of) the practice of holiness but only as “sanctified by the Holy [Spirit]”! How can we even claim to be followers of the HOLY ONE of ISRAEL, if we ourselves are not walking in the Spirit or saying it another way, living our lives for Jesus and exemplifying His holiness before a dark and dying world?? There are those occasions where the LORD orchestrates ministry for souls by different servants of His (1 COR 3:6), and Paul here in Romans is not advocating exclusive ministry, but that in his endeavor to preach the Gospel, he desired to venture into areas where the Gospel had not been heard, where the salvation message is needed. Where work had already been present and the growth was spiritually healthy, Paul would pass such locations over and search for ministry opportunities where it was needed most. While the church at Rome was established, there was a need for discipleship and of greater depth of doctrinal understanding, therefore Paul wrote this epistle to them, and intended on visiting them as well to inspect the work going on, and the fruit that was being produced in the lives of the saints there. Apparently, this fervent desire of Paul’s did not wane at all as it was “many years” before he actually was able to visit them (and by a somewhat peculiar or at least unexpected method as far as Paul was concerned; ACTS 25:10-12). We talk about our vacations and share pictures of our experiences while visiting other countries, and this can be a fairly routine event; with airline travel people can cross the globe in hours with very little effort. Not so in those apostolic days; visiting Spain from Israel was no casual journey. Travel by sea vessel was very archaic in those days and travelers met with hardships, extreme discomfort and even dangers at times. Yet none of these things would deter Paul, as he was intent on going to any lengths to preach the Gospel and seek the salvation of lost souls which he longed to win for Christ. Having that missionary fervor is a part of the life of any true believer; while we may not all be called to be missionaries or evangelists per se, we are all to do our part in the Great Commission (MARK 16:15) and sharing the Gospel with the lost; whether that involves street ministry, evangelistic crusades, television, radio, film, books, tracts, one on one visitations and, or Internet ministry – by any and all means the Gospel is to go out into all the world and reach the souls that belong to God (EZEK 18:4) but are desperately needy of salvation. Charity among saints should be a common and repetitive observation among the people of this world; generosity and compassion is appropriate among the church, for church members in want, but also for those outside of the faith (GAL 6:10). Here Paul reminds the saints he is writing to that charity for the church in Jerusalem is especially required, as it was through the nation of Israel that the Scriptures were given, and thereby blessed the world in the revelation granted to her prophets by God. Also it was through Israel that the Messiah came into the world, from Abraham to David, to Mary the mother of Jesus of Nazareth; so as the Gentile Christians reaped of the spiritual blessings of God’s people, so too, the church was in a sense obligated (“their duty”) to bless God’s people with material blessing. The fruit of love is demonstrable in the life of any true believer, and being moved with compassion when we see a need will spring us into action to meet that need, by the grace of God. So the saints at Rome heard of the dire situation in Jerusalem: how because these Jews had become Christians, they were seen as heretics by the Sanhedrin and Temple authorities and thus excommunicated “from the faith” of Judaism. This meant that they could not go to the Temple, they could not go to synagogue, they could not have any interaction at all with observing Jews, they couldn’t even hold down a job! Paul, having plans on visiting Rome would then receive alms from them to assist the church at Jerusalem in their time of need. The apostle likewise was confident that there would be great spiritual blessings in store upon his visitation of the church there “in the fullness of the blessing of the gospel of Christ” and all that this entails – the salvation of souls that the LORD would add to the church daily, the powerful bond of love that they as the LORD’s true disciples would have one for another, the peace of God as a result of salvation, the communion and godly fellowship as well as the fervent prayers one saint to another. This is exactly what Paul was soliciting in the next verse. For the sake of the LORD Jesus Christ, the Lamb of God Who died for the sins of the world, the One whose “compassions fail not” (LAM 3:22) and longs to see souls reconciled to our Holy God and Father – for His sake we ought to continue to pray for sinners and their salvation, and also for those who are full time in such activity of soul-winning such as our evangelists and missionaries. Paul the powerful apostle and miracle-working servant of the LORD petitioned for prayer? This writer of one third of the entire New Testament needed help from other saints? Yes, indeed; this shows that we are the body of Christ and that the hand cannot say to the foot, I have no need of you, nor can the eye say the same thing to the ear (1 COR 12:20-22) and that we are all dependent on Christ Jesus – directly, and indirectly as His Spirit operates and ministers through the saints in His Body. Each of us have been granted gifts and are strong in different areas in our lives. Where we are weak and needy, others are abounding in the strength of the LORD by the Spirit of grace, and this is to the point: we are ONE body, and no one can glory in their independent strength but rely on Christ’s strength (again, both directly as from His Spirit and indirectly as His Spirit operates in other members of the Body). Notice this also in verse 32, that Paul speaks of being “refreshed” that is, “to recruit oneself in company with others” and that this refreshment is not unilateral; he wasn’t intending on visiting them so that he could refresh them, but that they would be refreshed together in a mutual blessing! Again, here is evidence of what is called “body ministry” or saints that are serving one another in every capacity in which the members are individually gifted by the LORD (1 COR 14:26). Paul ends this chapter with “the God of peace be with you all. Amen.” And this seems a good way to end this article as well! ”Peace” in Hebrew is of course, “shalom” and it entails far more than merely peace (as we have seen previously). Such are the wonderful gifts granted to us by our LORD – such blessings that abound beyond any singular need, but is all encompassing in their ability to bless, edify and encourage. So, indeed, may the GOD of PEACE be with you all! AMEN!